I know, I know. I’ve been absolutely awful about updating this thing. However, I’ve been busy living. I’ve also been running, but not consistently. I decided I hate running in the heat (I also hate running in the cold, so I think I might just hate running) so I have been trying to squeeze in 1- or 2-mile runs after work. That can’t last much longer because we’re switching to a condensed work week for summer (8-5:30 Monday-Thursday and 8-12 Friday), so I either need to get into the habit of running in the mornings before work (unlikely) or just run on the weekends. We’ll see. So my roommate and I decided to run the North Suburban YMCA Fired Up 5K this morning. We had talked about it a while ago, but I was supposed to be going out last night and he thought he had a gig. My plans fell through and his gig was actually Friday night (I went, too!) so we had no excuse this morning. Yesterday morning we were DYING just existing in the morning heat. Well, OK. He was re-organizing the basement which meant several trips to and from the trash cans, and I was giving my window AC unit a deep clean, so we were doing more than existing but we weren’t exactly burning calories. Fortunately, this morning was a lot cooler. At least it was until we drove to the North Suburban YMCA, registered, and stretched on the playground. I was bummed because we watched the last t-shirt be given out to the guy registering right before us. Had we arrived 2 minutes earlier, we would’ve gotten free t-shirts too. Oh well – they were actually pretty ugly. The run was rather uneventful. Frank is a lot taller, so he runs fast, but takes more walking breaks than I do. So we kept passing each other for the first 1.5 miles, until the first water station. I was really hot, so I walked through the water station and then picked back up again. Just before the 2-mile mark was a very short, very slight hill that of course felt like a steep mountain to me. I walked up that and then ran again. Before I knew it (lies – it felt like forever) we were back at the water station, which I walked through again. The rest of the run was all trails, mostly in the shade. Really nice after such a hot, sunny first half, but also a lot harder to run (for me). I almost rolled my ankle once, and was doing the Kelly Ann version of intervals. This one girl in a pink tank top and I were obviously using each other as motivation, and kept passing each other. I saw what I thought was the finish line, at the end of a section of the trail through really big, loose rocks. I almost died but kept telling myself, “The guy with the orange flag is the end!” Wrong! He was just directing traffic, because we had to cross the main road again to get back to the start. That last .25 felt like a marathon. I really thought I might vomit. I’m not used to running at this hour when it’s so hot outside. And there was a little hill up the driveway to the finish line, and I tried to make it before the clock hit 34:00 but I missed it by a few seconds. Still – I beat my BAA 5K time of 34:28 with a time of 34:05! I have no idea how, because I never walked during that, but it was a lot more crowded at the start (and the whole race in general) and I was also running with my friends, whereas this time I was running completely on my own. I’m wicked proud! Frank finished around the 35:00 mark so while our running styles are very different, our average paces are pretty close. He shaved 4 minutes off his time since his last 5K, so he’s really got something to be proud of today! After the race, we were rewarded with hot dogs and hamburgers, salad, watermelon, frozen yogurt, and granola bars. We were home just after 10 a.m., with a full day ahead to enjoy knowing what I’d accomplished. 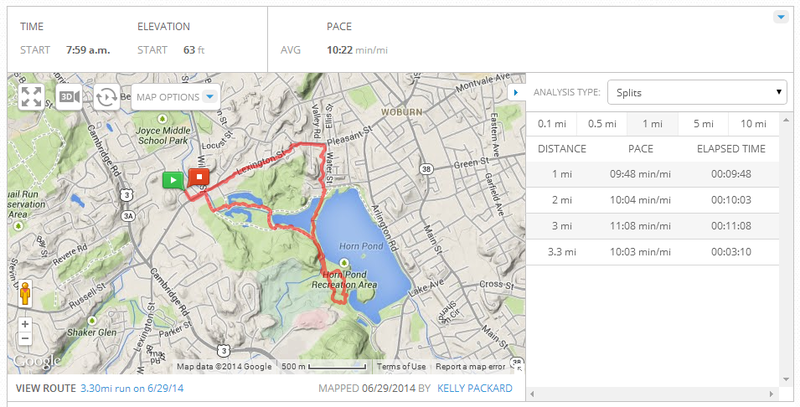 I actually plan on going back to Horn Pond after a few errands, once it cools down a little. Rags needs a haircut so I’ll do that then reward him with a walk at the pond, complete with a little swim.